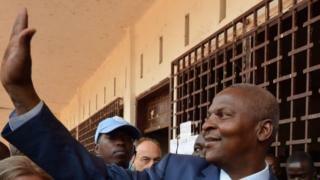 Former Prime Minister Faustin Touadera has been elected president of the Central African Republic in a run-off contest seen as an important step towards restoring peace. Provisional results showed Mr Touadera received almost 63% of the votes, defeating his opponent Anicet Dologuele who won just over 37%. Mr Touadera's campaign focused on restoring security. The country has been through a period of violent sectarian unrest. Prolonged bloodshed began after the seizure of power by mainly Muslim Seleka rebels in 2013. It is estimated that about a fifth of the population became either internally displaced or forced to flee abroad, leaving the country poverty stricken and divided along ethnic and religious lines. Mr Touadera, throughout the campaign, was portrayed by supporters as a peacemaker who can bridge the Christian-Muslim divide and boost the economy. At a press conference on Saturday night Mr Dologuele said he would honour the results and recognise Mr Touadera as president despite reservations about voting irregularities. Mr Touadera has vowed to encourage reconciliation and disarmament. "These elections are important but they are not the only step out of this crisis," he said. "We have to create the conditions for dialogue between the two communities. We will do everything we can so that Central Africans can live together in Central African Republic." Mr Touadera is a former maths professor who served as prime minister for Francois Bozize, the president of 10 years who was deposed in 2013.